Harvard spent $16.4 million on advertising in 2016, tax filings show—enough to book three 30-second primetime spots on Fox’s broadcast of Super Bowl LII. But the chances of Harvard actually purchasing such an advertisement are low. Walking around Harvard Square and the Greater Boston area, prospective students and tourists are hard pressed to find the typical trappings of such a sizeable budget—billboards branded with the University’s crest or posters emblazoned in crimson. In many ways, the Harvard name sells itself, according to Law School Director of Executive Education Scott A. Westfahl. Even the University’s newer revenue-generating programs, including executive education and the summer school, benefit from the brand. John Maguire, former dean of admissions at Boston College, distinguished Harvard from “institutions that are trying to position themselves in the marketplace,” which might need to engage in more general brand promotion. He pointed to Southern New Hampshire University, which he said has been particularly successful at this goal through its aggressive advertising campaigns. By contrast, Maguire said Harvard and its peer institutions have rarely needed to engage in this type of marketing. Instead, Harvard has chosen to allocate its sizeable advertising budget to promote short-term and traditionally less-emphasized programs, including executive and continuing education courses. Among its flagship schools and programs, Harvard does not suffer from lack of interest. Harvard Medical School’s marquee program, which grants M.D. degrees after four years of study, has a 3.5 percent acceptance rate and received nearly 7,000 applications last year. But the Medical School does not pay to advertise this program, HMS Spokesperson Gina Vild wrote in an email. The School of Engineering and Applied Sciences also takes a less active approach to marketing, according to SEAS spokesperson Paul Karoff. Karoff added that the College and the Graduate School of Arts and Sciences, which grant degrees on behalf of SEAS, mostly handle promotion and recruitment to prospective engineering students. James E. Paskill, principal and creative director at Paskill Stapleton & Lord, a higher education marketing firm, said universities advertise executive education—which consists of short, non-degree granting programs—differently than they do these long-term degrees. Much of Harvard’s advertising dollars go toward lucrative short-term programs, like the several executive education programs Harvard has developed in recent years and the Division of Continuing Education’s extension and summer courses, according to University spokesperson Melodie L. Jackson. “In general, this includes advertising and marketing expenses incurred by schools and departments across the university,” Jackson wrote in an email. PBD has designed advertising materials and campaigns for a number of Harvard schools, including the Division of Continuing Education. Business School Chief Marketing and Communications Officer Brian Kenny said this is especially important due to the high amount of competition within the field of continuing education. Harvard Medical School offers executive education programs as well, which it markets on multiple platforms, Vild wrote. She wrote that the Medical School uses both digital and print advertising to reach different audiences—including academics, healthcare executives, students, and members of the general public. Unlike other leadership programs for professionals, the Law School’s program is an opportunity for further education in the legal field, Westfahl said. Schools and departments largely determine how to allocate their own advertising budgets. Some outsource their marketing efforts to independent firms, while others handle campaigns in-house. Among the outside firms used is PBD Partners, a Cambridge-based digital media and advertising studio. 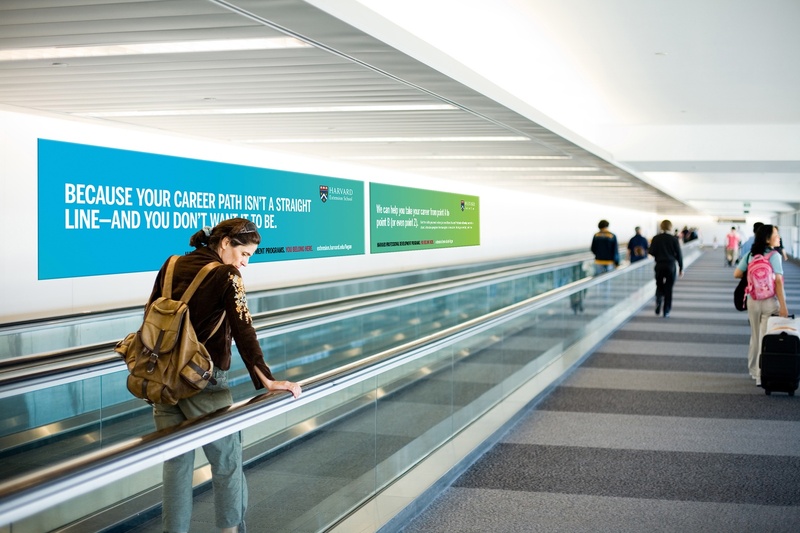 PBD has created advertisements for the Harvard Extension School that debuted on MBTA trains and in Logan Airport. Shannon Beer, the firm’s principal, said her firm works closely with schools to design materials that best serve the school’s interests. Some graduate schools prefer to keep most of their advertising in-house. Linnea L. DiPillo, a marketing specialist at the School of Public Health, agreed that “we know our programs best." She said this is why the School of Public Health does much of its own marketing. In recent years, schools including the School of Public Health have started using their social media accounts as a cheaper, but still effective, alternative to expensive ad campaigns or mass-emails. DiPillo said LinkedIn posts about the school’s executive education courses have constituted some of their most effective advertising efforts. The School of Public Health has also specifically targeted their alumni with marketing materials for their executive programs. “We mail to an internal list including our alumni for each program as well as purchase mailing lists from organizations that have a similar audience to what we’re targeting,” DiPillo said. When Harvard does spend on its more high-profile programs, it does not plaster advertisements on public transportation, but rather invests in market research. Mark Cunningham, an executive vice president at Massachusetts-based marketing firm Carnegie Dartlet, said this type of research is especially valuable for selective, prestigious institutions like Harvard that do not need to focus as much on brand awareness or increasing enrollment. Cunningham said these universities conduct market research in order to determine the best strategies for their own digital marketing efforts. “What perceptions you might understand and shift... can dictate the way that you might approach digital marketing,” he said. Kenny said the Business School works to change certain perceptions about the school through school-wide marketing efforts. In particular, he said the school has emphasized the strength of its entrepreneurship programs in response to market research. Marketing tactics differ between Harvard’s graduate schools. Westfahl said that the Law School’s marketing materials are intentionally understated to best appeal to their target audience. “If something looks overproduced and flashy, lawyers are inherently skeptical about it,” Westfahl said.